Received May 17th, 2011; revised August 19th, 2011; accepted October 2nd, 2011.
to 179 Bq·m–3) were found. levels over large spatial scales. omy in establishing action levels. tions in the near fu ture. thern tropical r e gi o n (re gi o n III). mm. The three regions are shown in Figure 1.
almost entirely occupied by Mexico City. 100 in each state) were used in the survey. diglycol carbonate (PADC) as detector material . new CR-39 material arrived from the producer. geny from radon concentration measurements . three regi o n s o f the survey. 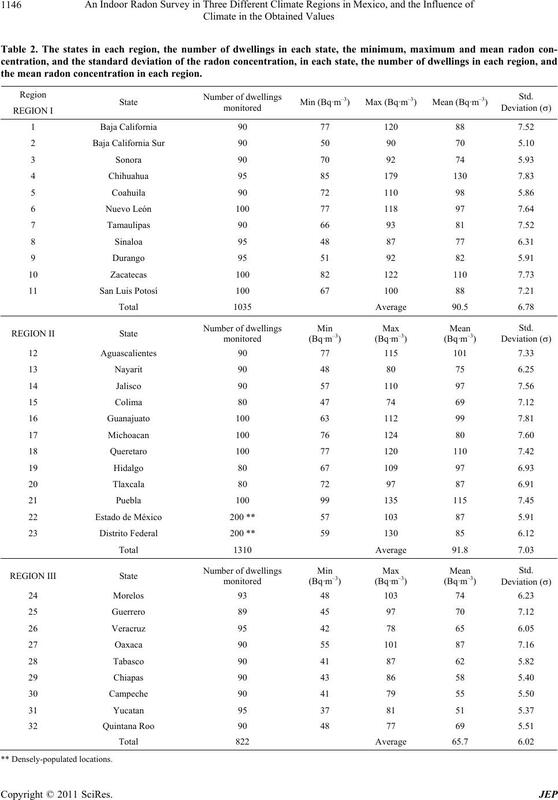 region, and the mean rado n concentration in each region . ods most commonly found in each of the three regions. 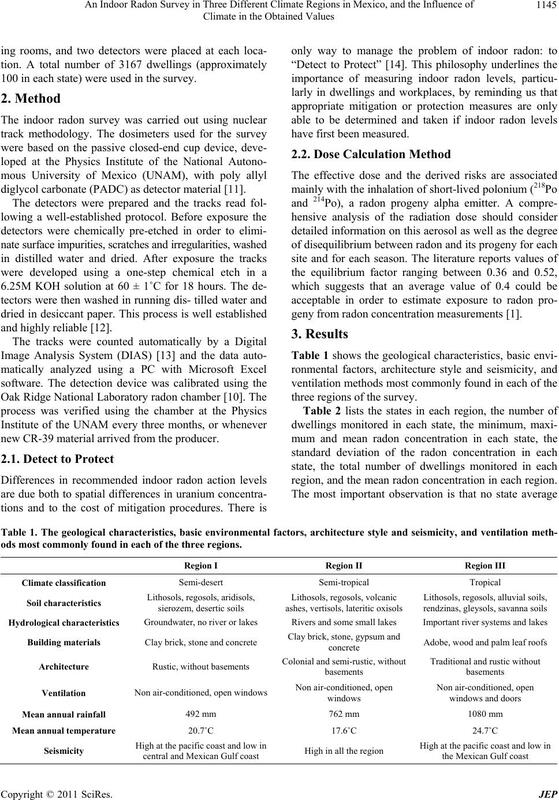 the mean radon concentration in each region. measurements and cover large geographical areas. 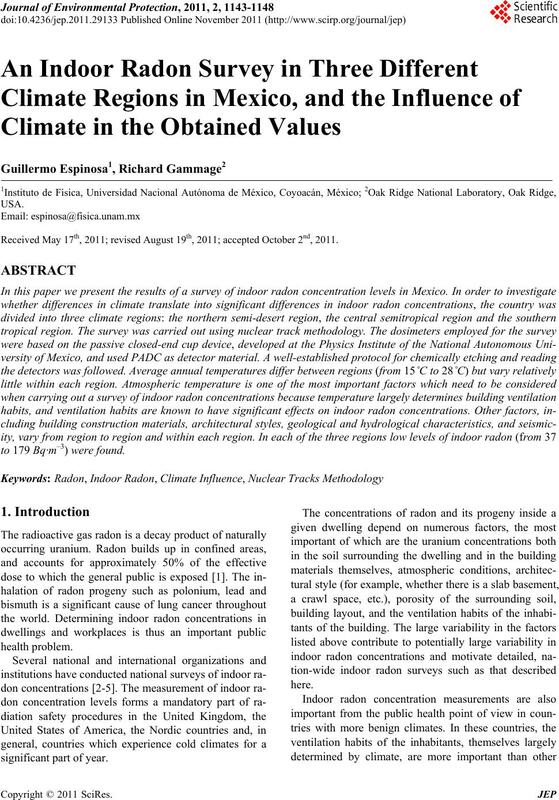 radon surveys at a worldwide level. respectively, and an 80% occupancy rate. and by PAPIIT-DGAPA-UNAM project 1N101910. Ionizing Radiation,” United Nations, New York, 2000. No. 3, 1998, pp. 370-378. Health Physics, Vol. 97, No. 3, 2009, pp. 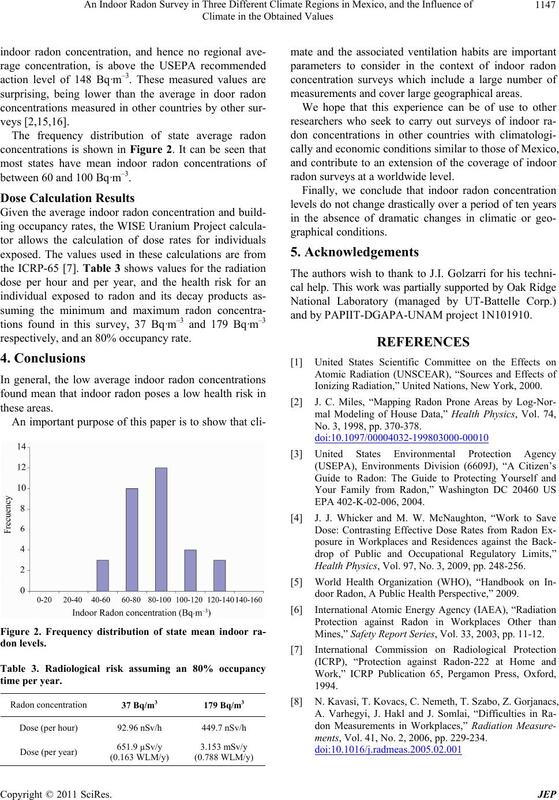 248-256.
door Radon, A Public Health Perspective,” 2009. Mines,” Safety Report Series, Vol. 33, 2003, pp. 11-12.
ments, Vol. 41, No. 2, 2006, pp. 229-234.
and Nuclear Chemistry, Vol. 236, 1998, pp. 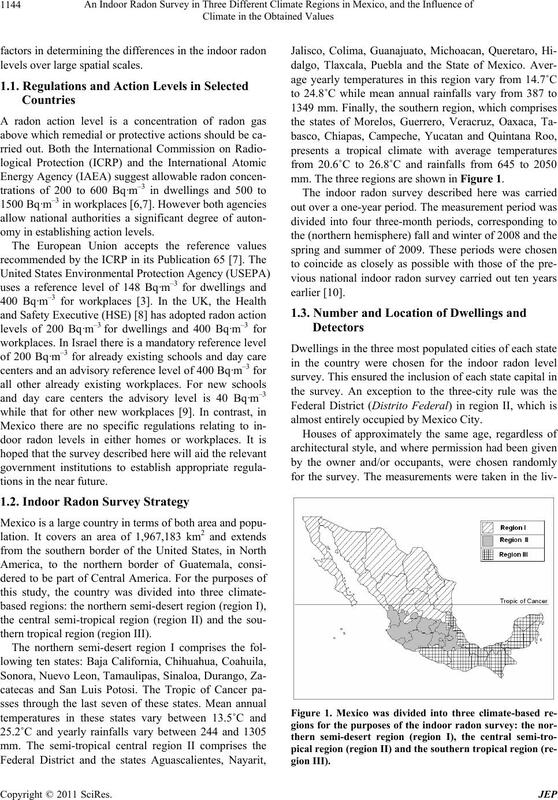 227-229.
urements in Mexico City,” Radiation Measurements, Vol. 43, Suppl. 1, 2008, pp. 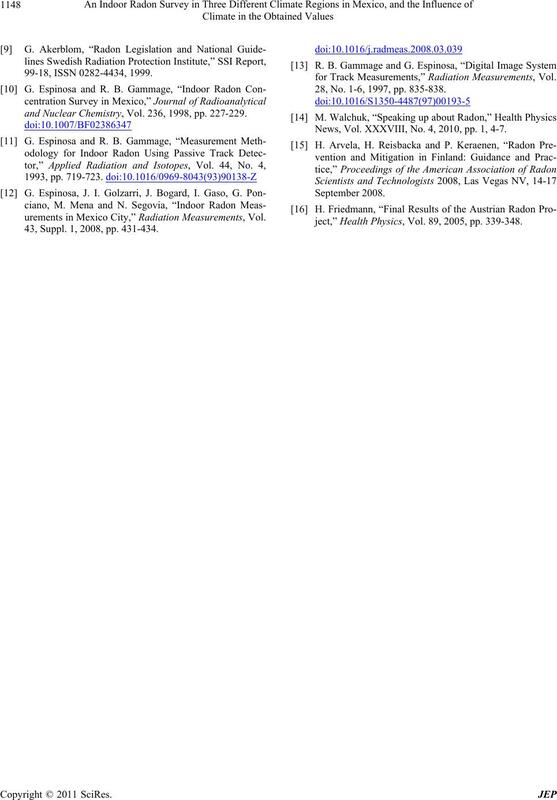 431-434.
for Track Measurements,” Radiation Measurements, Vol. 28, No. 1-6, 1997, pp. 835-838. News, Vol. XXXVIII, No. 4, 2010, pp. 1, 4-7.
ject,” Health P hysics, Vol. 89, 2005, pp. 339-348.